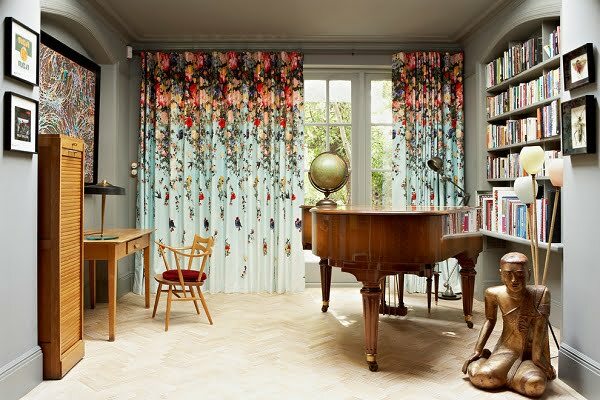 Looking for the perfect living room curtains to dress up your windows? Here are 20 best modern curtain ideas for 2019 to inspire you. Window dressing can make or break the entire decor of a room. That’s why choosing the right living room curtains is so essential. It depends on so many variables, and you have a lot of things to think about before making a choice. And no matter what design style you’re going for, we’re here to help you with inspiring ideas. From modern to eclectic, from rustic to industrial and so on. There are as many curtain styles as there are decor styles so you can mix and match to get the result of your liking. 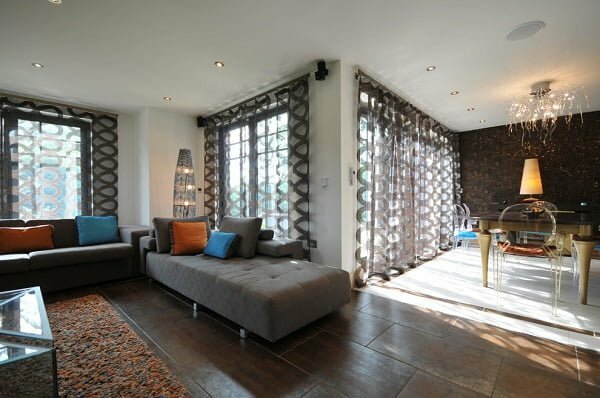 We’ve picked 20 very diverse and creative ideas of the living room curtains so that you have a lot to choose from. We are sure these ideas will help you create your mood board and choose the right curtains for your living room. The list is updated for 2019. 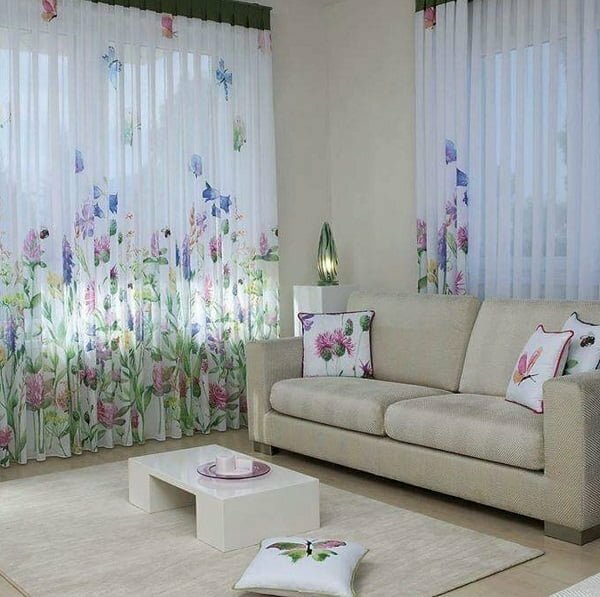 Nothing better adds some luxury to your home decor as the choice of the right curtains. In this case, emerald green velvet living room curtains will have this effect on your interior design. Most importantly, these curtains on Etsy are handmade and have the same high quality as big brand names, only at a fraction of cost. The recommended decor style for these emerald green curtains is modern with classic accents. The deep color tone of the window dressing creates so much visual drama. 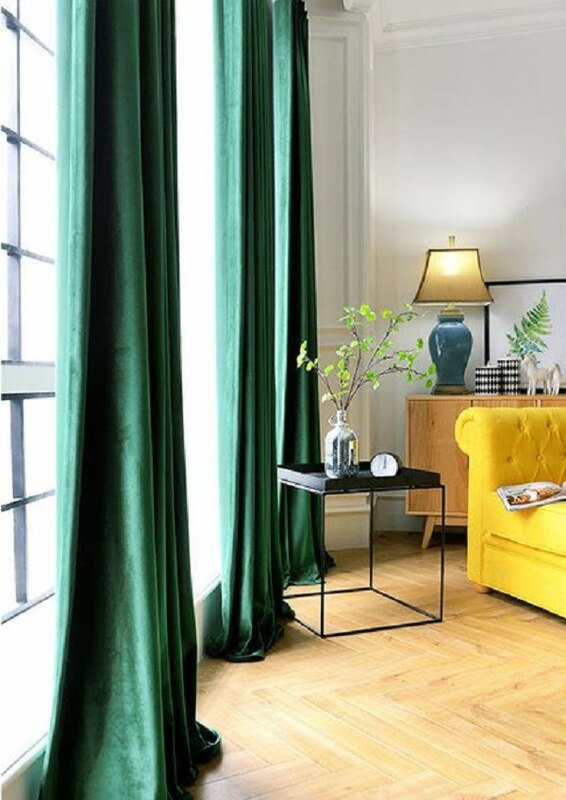 You can add some yellow accents (such as a sofa) in pops of color to add even more decor interest with these curtains. 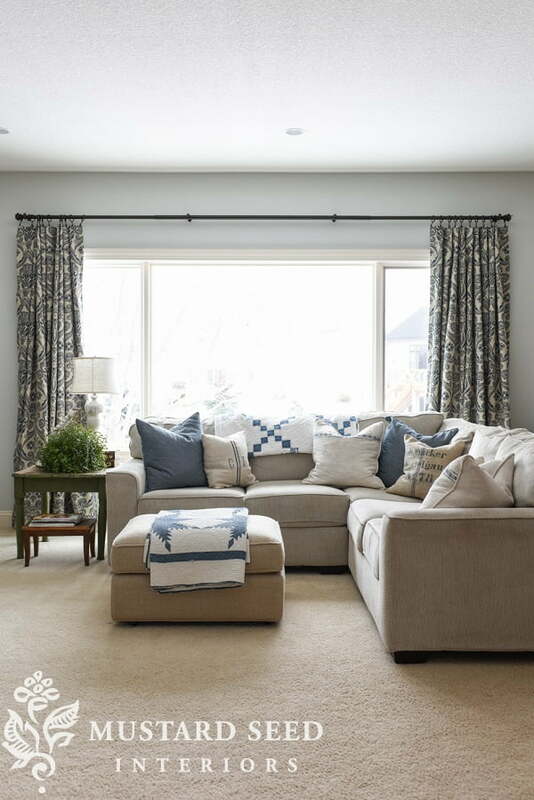 Navy blue is the new classic, and you can see that with these living room curtains. This color and material work so well with neutral tones of the room’s design. 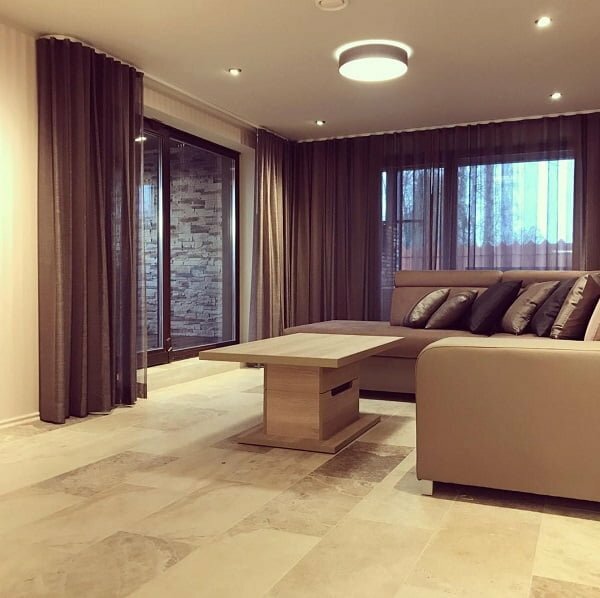 These curtains come from the same maker as the previous product, so they are very similar, yet so they are very different as far as the decor effect goes. 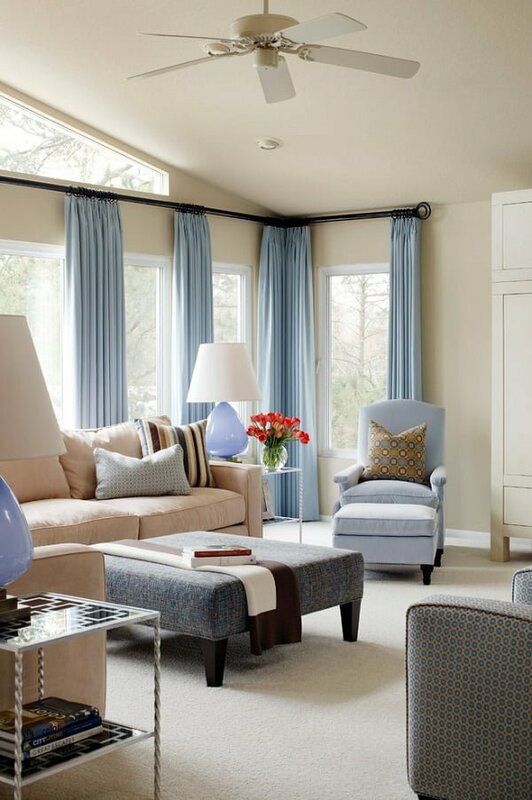 We recommend using these living room curtains with blue or grey tones in your interior design with pops of bright color. These can be bright yellow furniture or accessories. 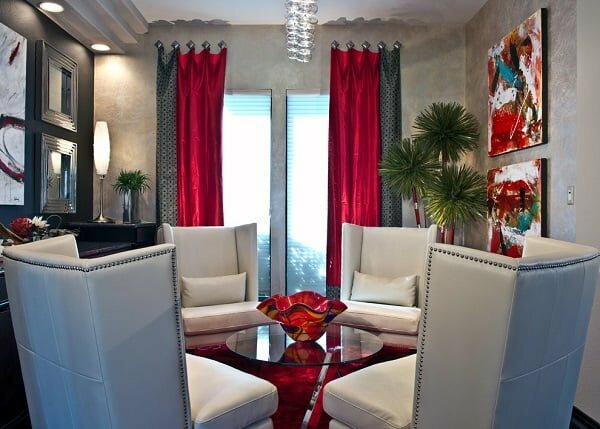 Modern interior design requires bold accent statements and window treatments can correctly play that part. 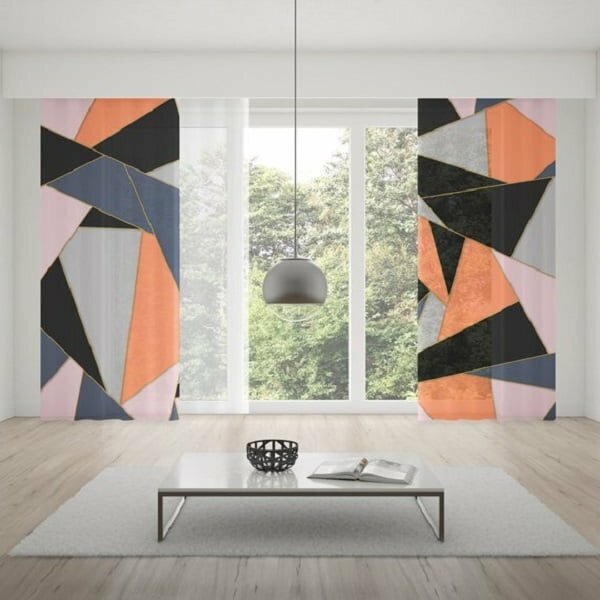 These geometric living room curtains can make a striking accent that would transform the decor completely. You can use geometric accents in different design styles too. Basically, think of when you want to make contrast or visual drama. 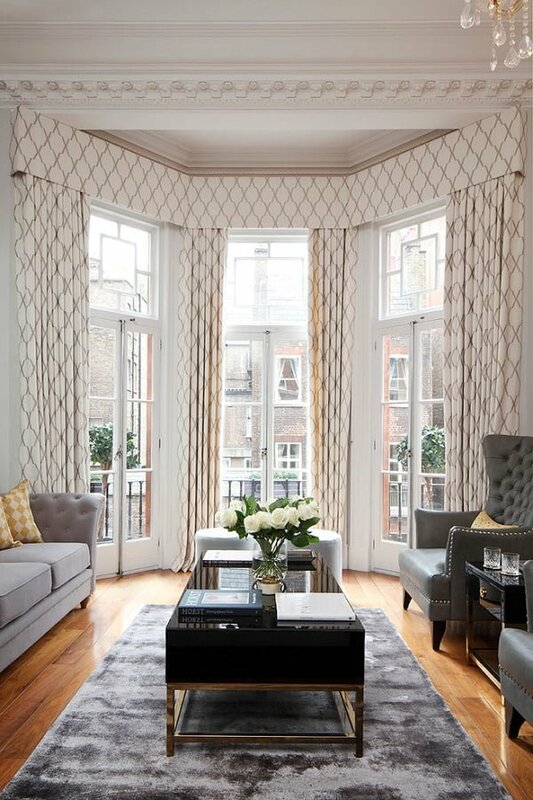 Such geometric print curtains can make a great focal point of the room also. Here’s how you make a decor accent from plain grey curtains. Handpainting them in ombre colors does the trick. It’s a great way to create custom decor with personal character. Keeping the color tones neutral doesn’t disturb the style of the interior design either. Curtains of this design are universal in what styles of decor they can be used. They can add a personal touch in cold modern decor or a cozy accent in rustic farmhouse decor. Floral design curtains aren’t tacky at all if they’re used in the right way. This example is an excellent example of how you can use florals as a decor accent even if you’re not going for the eclectic style. The color of the living room curtains pertains to the bookshelves and wall art to create a harmonious decor. The earthy tones of natural wood furniture and art make the perfect anchor for the eclectic design. One of the best ways to get your living room curtains right the first time is to visualize in advance. These austere black-and-white curtains are the perfect accent for the white-dominant room in which they are placed. This is an excellent illustration of the way in which an almost-perfect match between curtains and furniture is superior to the effect that an exact duplication between pieces would bring to space. Another excellent example of working with close variations on a unified theme. The muted gray hues of the curtains perfectly complement the gray trim paint and dark toned furnishings that quietly proclaim this to be an excursion into upper-class elegance. Contrasting bites of color, in this case: blue, set off the classic gray theme of this room. Floor length curtains stand sentinel over the massive view wall and provide a sense of surprising intimacy. Wow. 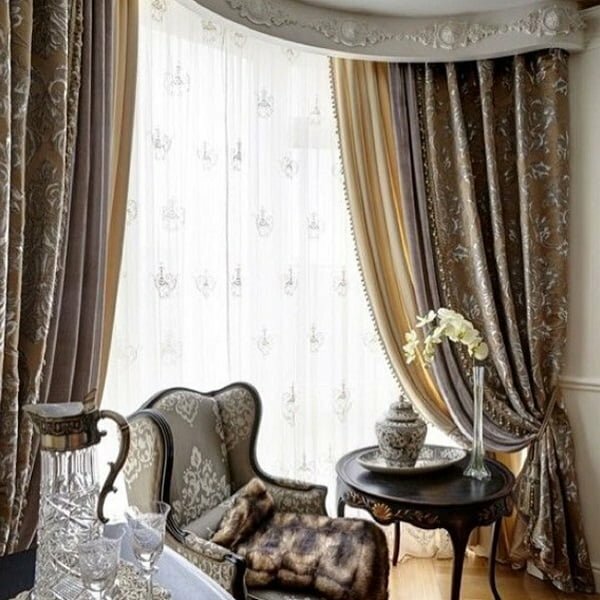 What a dazzlingly perfect union of curtains and valance treatment that create a fantastic sense of sensual continental elegance a la Versailles. Really. Just wow. 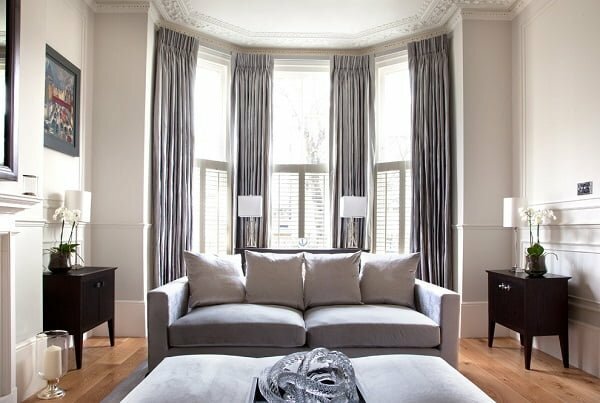 Extending the height of curtains to be a wall covering rather than a window covering allows the regrettable necessity of a curtain rod to be moved high up beyond eye line. Vast improvements in the energy efficiency of windows have led to an increase in their size, which in turn leads to stunning new ways in which ordinary curtains become major statements. 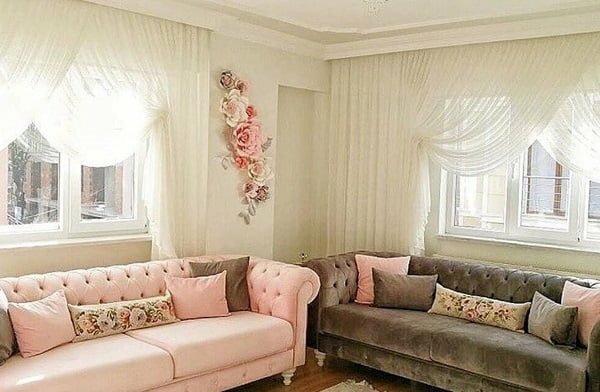 The trend is all towards wall length curtains this season, as shown by this visible yet impossible to ignore set of curtains done in simple white linen. Retro look room with bright splashes of bold primary colors offset by the overall gray background theme. This contrast between pop and contemplative elegance draws the eye as intended. This aptly termed salon features diaphanous white draperies that artistically capture and then diffuse the brilliant sunshine streaming into the very feminine interior space. For the right kind of space, this Danish Modern themed room features many carefully-aligned variants on an overall chocolate theme. Artful use of baby spots provides further layers of colors to explore even on the same fabric. Sedate Victorian elegance abounds in this pristine room. The use of airy yet opaque sheers coupled with classic heavyweight Victorian drapery serves to both frame and massage the light coming inside. Wonderfully whimsical departure from the current trend towards traditional fabrics and presentations. 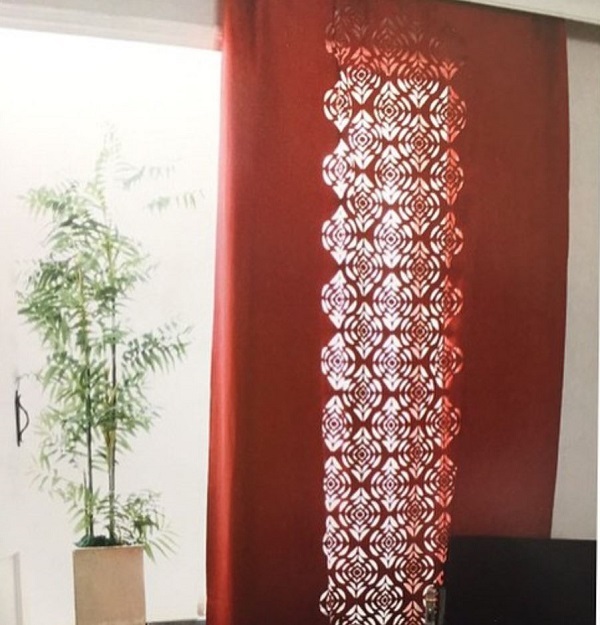 This lovely and diaphanous set of curtains provides a beautiful snap of color and brightness to an otherwise monochromatic theme. 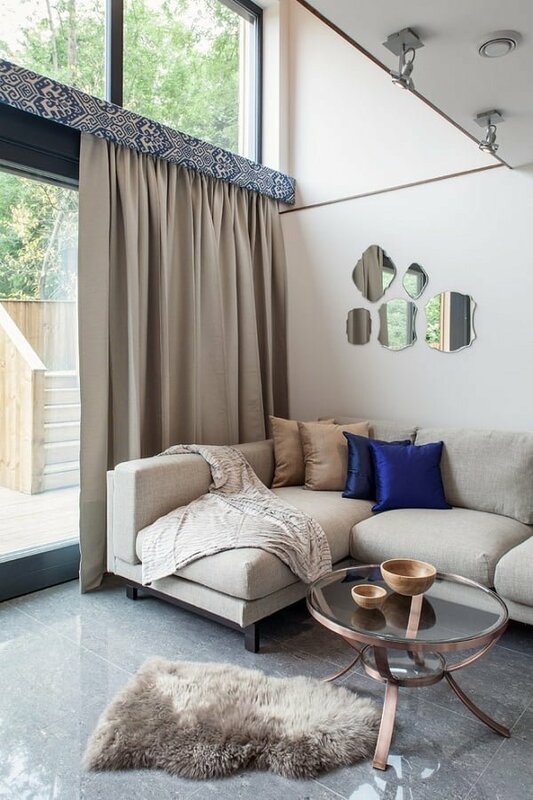 These floor sweeping curtains are the perfect choice for a tall ceiling contemporary space. The deliberate choice of leaving the skirts dragging creates an unforgettable evocation of movie star glamour from the 40s. Elegant style from North West Asia is found in these ornate Korean wall hangings. An exciting departure from the concept of curtains as a frame in which they become the center of attention rather than its faithful servant.